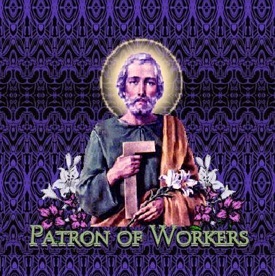 HE FEAST OF SAINT JOSEPH THE WORKER was this past Wednesday, May 1st. Instituted in 1955 by Pope Pius XII, it is a day dedicated to the dignity of labor. This feast has me reflecting quite a bit, mostly of my countless colleagues who work tirelessly for God’s glory. The more professional networking I do, the more opportunity I have to listen and discover the inner workings of others’ professional lives. What I have found is extraordinary commitment and dedication. But what I have also found is something all too common and sad. It is clear that one difficult theme persists. If one has been a sacred musician long enough, one will encounter great challenge and sometimes even grave adversity. Even musicians who might appear to be in very secure and enviable positions, are at times in peril. (It is important to note that no one denomination is immune from this.) Church musicians carry “battle scars” of the profession. We can all tell “war stories.” While very sad, this speaks to the frail imperfection of human nature. Adversity comes in myriad forms and often unique to each situation. There are the more common issues of low pay, endless hours, or perhaps obstacles to maintaining the integrity of the liturgy and music. Then there are problems individuals inflict upon one another – lack of charity that sometimes reach the level of professional abuse. Some stories are “jaw dropping” – that those who work in a Christian environment can treat each other with great professional insensitivity, no less in such an unchristian manner. These are the most troubling “war stories” that have people wisely updating their resumés and looking for new positions, a new parish, or a new choir. It may be surprising to some (and not to others) that the perpetrators are often clergy or music directors themselves. Especially during a poor economy, the supply/demand graph does not favor the employee or a musician who needs a gig to pay some bills. When those in authority mistreat those beneath them, sadly it is insecurity that is most often the root cause of such problems. That’s all—personal insecurity. So what does one do in such situations? When things go wrong, we must be even more mindful to do our jobs with great personal and professional integrity. In turn, we will hopefully earn respect and loyalty from those who matter. How does one earn respect? By giving it! I have to offer a few reflections, in no particular order, but I write this for myself as much as I do for anyone else. These are not simple solutions, nor perhaps even solutions at all, but I pray this may be of help to those undergoing difficult times. •	It’s never about you. We could all be gone tomorrow. We are here to serve God and each other. Never make the music or rehearsal about you. That doesn’t preclude being firm or confident in your vision, but the end goal is the greater purpose. In success, deflect credit from oneself and give credit to others. Your choir will appreciate this more than you will ever know. •	Admit mistakes. No one is perfect. When scattered and multitasking, my mistakes are plentiful! Don’t be afraid to make mistakes nor to admit them. (A self-deprecating sense of humor doesn’t hurt either!) The choir, staff, and those working with you will appreciate this more than you may know. •	Firm but always pleasant. (I have to remember this one.) The best way to get the most of your employees or singers is to set clear guidelines, expectations, and be always pleasant or at least even-keeled—a tough one for artists! Unpredictable moods make for unhappy singers or employees. Even when exhausted or stressed out, a consistently cheerful and respectful demeanor will be appreciated by your choir more than you may ever know. •	Always thank people—many times! Never cease thanking your singers, professional or volunteer! Show appreciation! No one gets tired of being thanked. Do you? Some hard working people are starving for gratitude. Perhaps this is the MOST important one. •	Pray always. Prayer works. I’m convinced! Pray for each other. Furthermore, when people know you are praying for them, they appreciate its healing power more than you will ever know. •	Have a support group. Whether it is colleagues, friends, people you can lean on, it is important to find those around you who appreciate your work and dedication. Likewise, be supportive of each other! Many “angels” have entered my life at just the right time to offer support, without who I would have been lost or in great trouble. Support each other: You never know when that support will lift someone when they need it most. Finally, know that God is watching over you and knows when you need help. •	Forgive. This is the most difficult, but perhaps the most important one. Realize, the person who will benefit most is the one who forgives. Forgiveness covers a lot of ground. What do I mean by that? It will reveal many blessings you perhaps never expected. It will form an internal change within. In time, this change may even be discernable to those around you. However, forgiveness sometimes is not a one-time event. It can be a daily struggle. One may have to forgive over and over. Like practicing your instrument every day, forgiveness takes daily practice. It gets easier in time. It goes against one’s instinct to love one’s enemies, but this is the love Jesus calls us to do. Remember, forgiveness and prayer do not preclude looking to change or improve your work environment. The spiritual and the practical most go hand in hand. Adversity strengthens us to move forward.